Some recipes are worth repeating and repeating, again and again. This is one such recipe. I first discovered and made this recipe about 5 years ago. I fell in love at first bite. 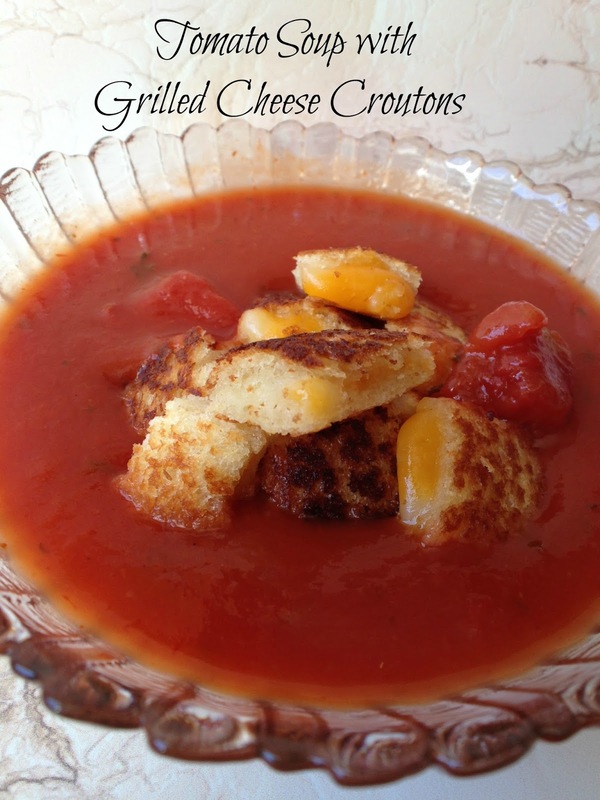 I know your thinking, what’s the big deal…it’s tomato soup with a grilled cheese sandwich…I’ve been eating that combination since I was in kindergarten. 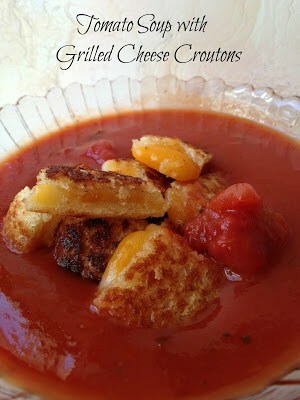 That might be true, but have you ever eaten homemade tomato soup with grilled cheese croutons? One of my favorite lunch-time meals, hands down, is a bowl of tomato soup and a grilled cheese sandwich. So when I saw this recipe, so many years ago, I knew I was going to give it a try….I have been making these ‘croutons’ ever since. 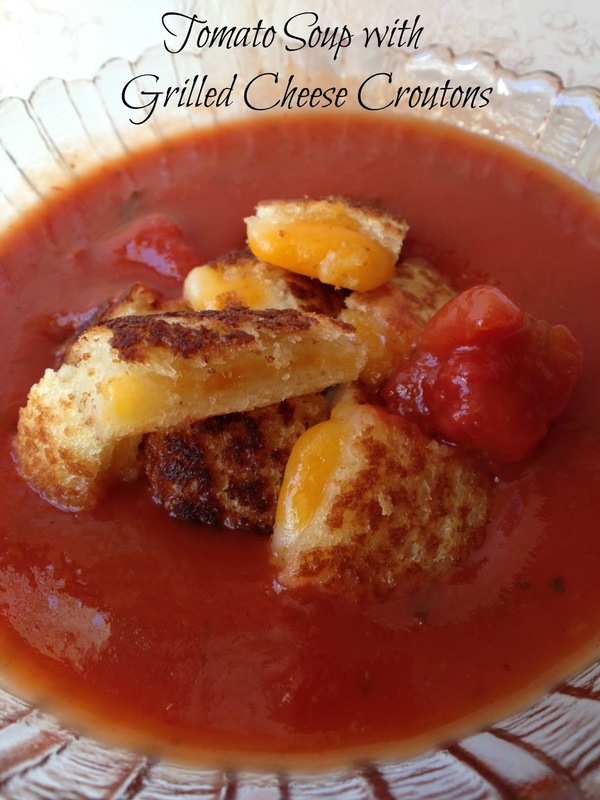 I’ve tried them on other soups, even chili, but my favorite combination is still the classic tomato soup and grilled cheese combo. When making homemade tomato soup, fresh of course, is always best. When tomatoes are in season (July-Sept) here in Wisconsin, it really isn’t ‘soup’ season. Needless to say I still make a batch of tomato soup using fresh picked tomatoes. I have yet to tackle the job of canning tomatoes, so more times than not, I make fresh tomato soup with store-bought tomatoes. Here is a little trick I learned, set store-bought tomatoes stem end down, on a sunny window. After a few days even up to a week later the tomatoes have ripen nicely and some of that ‘store-bought’ taste is gone. I’ve even used canned tomatoes with ‘good’ results. 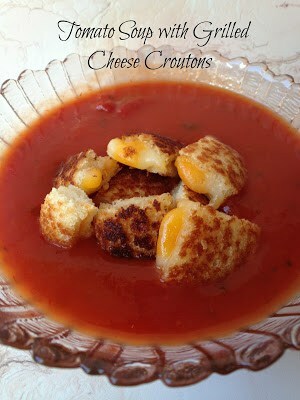 Like I said fresh is best but when it’s cold outside and you have a hankering for a bowl of tomato soup with grilled cheese croutons, I can and will make do with the store bought kind or canned. In a large saucepan, combine tomatoes, water, onion, celery, garlic, tomato paste, parsley, bouillon granules, lemon juice, hot sauce, sugar, salt and pepper. Bring to a boil and reduce heat. Cover and simmer about 20 minutes or until celery and onion are tender. Cool slightly, place half of the tomato mixture into a blender, blend well. return mixture back to the saucepan and heat 5 to 10 minutes longer. Serve with grilled cheese croutons. Cook until golden brown, about 2 to 4 minutes. Flip and cook until golden brown on the other side, about 2 to 4 minutes. Cut the crust from the grilled cheese, cut into 1 inch squares.